This deli makes even the most traditional New Yorker feel right at home, with tall stacks of corned beef or other deli meat, hamburgers, hot dogs and breakfast sandwiches. This deli makes even the most traditional New Yorker feel right at home, with tall stacks of corned beef or other deli meat, hamburgers, hot dogs and breakfast sandwiches. For the very hungry or just plain adventurous, there are also 3-layer club sandwiches and giant specialty sandwiches, which can be shared by at least 2 people. All of this high-quality food is served up quickly, at reasonable prices. Try the pretzel bread for a new twist on an old favorite. Breakfast has been added to the menu with a variety of traditional favorites from pancakes to breakfast sandwiches, so it is also a great place to start the day. 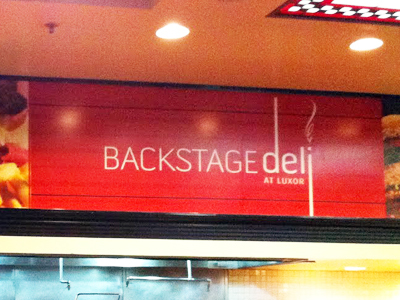 Luxor is not my first choice of hotels to go to but my first stop this trip was for the backstage deli!!! The have delicious sandwiches for a great price!! !